Well basically my dad acquired this bike when I was a young lad. He never really talked about it much. He just showed up with it one day. It had a couple small dents in the fenders and they had a really old metallic gold lacquer paint job. The frame was black but it appeared to be completely stock. The miles are under 6,000 and I actually started it up when I was in high school. It runs great but the electric started made a bad noise. I took it apart and put the parts in a glass jar and covered it up. I've had a few cars, trucks and motorcycles since then so I really didn't pay the ol Superhawk any attention until now. Well actually before our family moved from our old property I made sure that I stripped it down real quick and painted it. 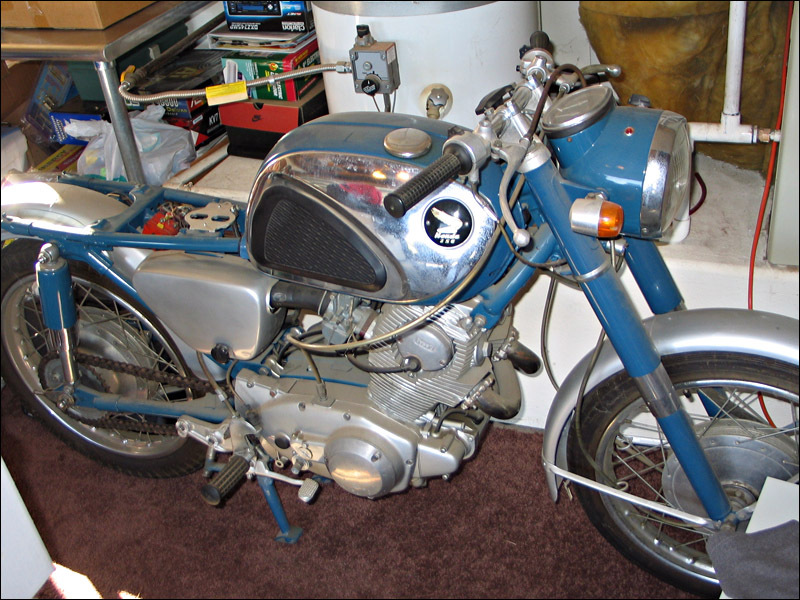 I did a silver and blue paint job on this bike when I was just out of high school. We had a nice shop at my old house so I took advantage of it and did a light restoration on this bike and since it was all original it didn't cost me anything. I do remember that this bike had great compression and was fast. I can't wait to do a little work on it this summer and get it going again! And here is a quick picture I took of it as it sits now. Man that dust is really starting to pile up. I just love this picture. I need to find a helmet like that! Here is some more history of the Honda CB72 as written by TWO writers who both owned one back in their prime! There is one account of owning a Honda 250 on the top and another at the bottom of this page. Good readin! 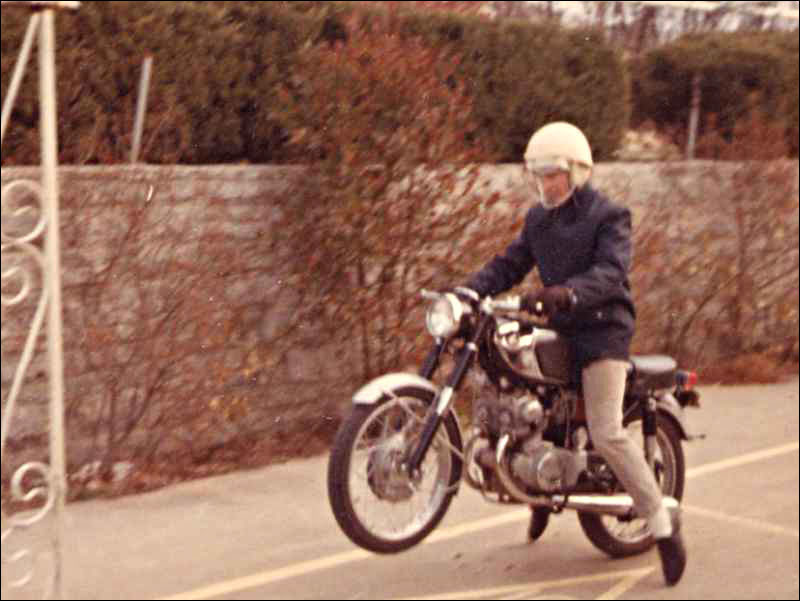 On the same site you can also read about first hand accounts of owning/operating a Honda Black Bomber 450! My father has one on display inside his house and wow what a one of a kind machine! No but seriously, I've been looking everywhere for this bike that someone's selling so let me know if you see anything. Yeah they are VERY hard to find for sale. What's your limit pricewise? Some people think they can just find them for like $1000 in good shape. That will never happen. I think I would expect to spend up to $3500 on a really nice and somewhat original one. I'll let you know if I ever come across one for sale. How is this bike coming? Are those Scrambler pipes in the later picture? My CB160 project is the little brother to your bike. I am going with black and silver. I had to paint the tank eight times before it came out right. I am having a lot of fun. After searching fruitlessly since last summer for a nice set of muffs I managed to find both in the past two weeks. David Silver had two complete nos right side sets (muff and header pipe) that were inadvertently lost in their inventory and not listed on their website. I lucked upon them because I had bypassed their website and contacted them through email. They replied that they had them in stock and to buy a set through their site. I told them their site listed them as not available leading them to discover their error. I noticed the second set was gone in less than a day. Huge progress for me as I'm trying to go a's factory as possible. I'd like to see how your big brother to my cb160 is coming. Good morning, the ol 250 is just sitting quietly in a nice warm garage. I've been doing the dirt bike and dual sport bike thing for the last two years so my vintage collection is sitting pretty. I assume those are scrambler pipes that were installed by the first owner. I really like the look and they fit like they were from the factory so they will remain. It's hard not to go with the black and silver as that was the most common color and looks very sharp. Good call for a CB.